Pictured are County Clerk Diana Cromley and Mason County Commission President Rick Handley presenting Lorrie Wright, WVU extension agent, with a donation from the county for the 4-H Dining Hall renovations. POINT PLEASANT — The renovations of the 4-H Dining Hall are over half way complete and a recent donation from the county will significantly help the Mason County WVU Extension Office employees reach their goal of finishing the repairs in the kitchen of the dining hall. 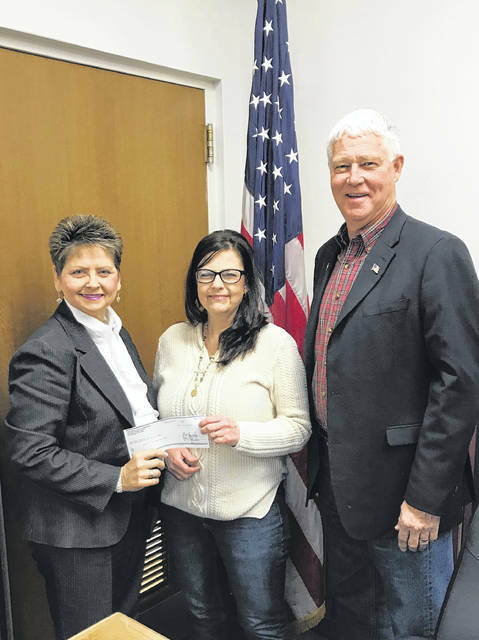 The office of County Clerk Diana Cromley gifted $10,000 to the Mason County WVU Extension Office to be used as needed for the 4-H Dining Hall renovations, accepting the donation was Lorrie Wright, WVU extension agent. Cromley explained the funds came from her office’s elections fund which had carryover money from the county clerk’s budget. Mason County Commissioners Rick Handley, Tracy Doolittle, and Sam Nibert approved the donation. The 4-H Dining Hall was used as a voting precinct for two voting cycles, the former precinct being the Southside Community Building. Cromley commented the dining hall is spacious, handicap accessible, and has a good parking, making it a favorable location for a voting precinct. Cromley, speaking on behalf of the county, shared they are all happy to help towards the completion of the dining hall, not only for the space being used as voting precinct, but also for the 4-H campers enjoyment as well. In 2015, the dining hall was torn down with construction on the new dining hall beginning in June of 2016. Wright said as of right now the renovations are 75 percent complete at the dining hall and the main goal is to finish the kitchen before 4-H Camp this summer. The kitchen has heating and cooling units, electricity, and water, but still needs trim work done and to be painted. Numerous fundraisers have been held by the Mason County 4-H Leaders Association for this project such as the selling of memorial bricks, which are still available for purchase at $100 per brick. Many donations have come in from the community and many local businesses. Also, a large grant was also given by the Community Foundation of Mason County and several other grants were given by the Jackson Foundation. Wright commented this project has been a collaborative effort and individuals not even in 4-H are seeing the benefits of this renovation and want to help bring the project full circle. After completion of the kitchen, renovations will begin on the classrooms and then the brick work will begin for the memorial brick wall. For those interested in purchasing a memorial brick, contact the Mason County WVU Extension office at (304) 675-0888.